A multibagger stocks have potential to give multiple times returns to the investor. Investors are always looking for a good multibagger stock for the investment. A multibagger stocks can make investor wealthy in a short period of time. In this post, we will talk about multibagger stocks of FY18. The fiscal year 2018 was an average year for the stock market. At the beginning of the year, we have seen stock market has surged but at the end, due to LTCG, many stocks have lost its shine. However, despite of ups and down many small-cap mid-cap stocks have turned out to be mulitbagger this year. Truly speaking it is very difficult to identify multibagger stocks for the investment. You need to consider multiple factors such as earning potential, a line of business, debt level and several other business aspects. Here is a simple method to identify Multibagger Stocks. How to identify Multibagger Stocks? Firstly you need to shortlist a stock and do a fundamental analysis to find out if a stock is fundamentally strong or not. You need to consider various financial ratio in order to do fundamental analysis of the stock. Find out product and services offered by the company. Also Check Company is in the business for how long? And, a business model of the company is sustainable or not. A company should have good earning visibility with scalability in operation. A company’s product should be in demand. A company should have favorable future business potential. You should check do company enjoys a competitive advantage over other? Business expansion, a global market presence or new monopoly product could be added advantage. A performance history of a company should be good. A revenue of the company should be growing quarter to quarter. A company should have low debt. The valuation of stock should be low. A chance of getting multibagger performance is very high in small cap and mid cap segment. Hence, one should try finding high quality less popular stocks in small cap and mid cap segment. 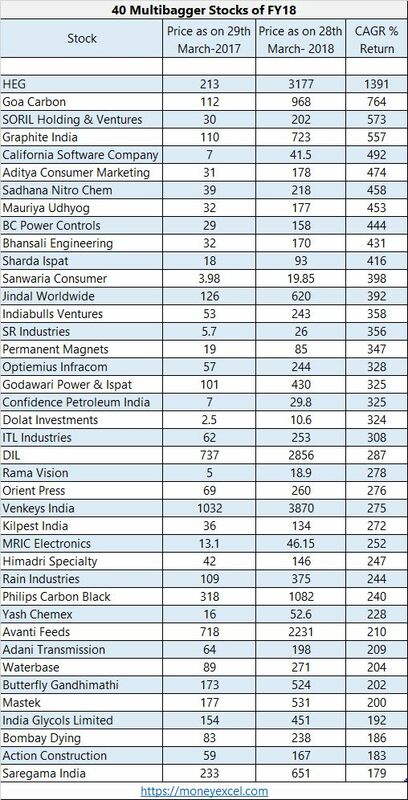 A complete list of 40 Multibagger Stocks of FY2018 is given below. A first stock in the list is HEG. HEG generated 1391% return for the investor in last one year. Other multibagger stocks in the list are Goa Carbon, SORIL Holding, Graphite India, California Software, Aditya Consumer, Sadhna Nitro Chem, Mauriy Udhyog, BC Power Control, Bhansali Engineering and Sharda Ispat. These stocks have generated 400 -700% return to the investor in last one year. All these stocks have generated multifold returns for the investors. If you are impressed with this stocks and planning to invest in the stock market. Here are potential multibagger stocks for 2018. A first Potential multibagger stock is GIC. GIC is housing finance sector company. Net profit and sales of GIC are growing YOY. This indicates the financial performance of the company is good. A company is also maintaining healthy dividend payout of 21.53%. Valuation of stock is reasonable. Upcoming infrastructure development is likely to give multifold benefit to GIC. GIC is one of the favorite stock of Porinju Veliyath. The second potential multibagger stock is Birla Corporation Limited. Birla Corporation is Mid Cap cement sector company. It is a nearly debt-free company. Past performance of this stock is very good. Similar to GIC this stock is likely to get a benefit of upcoming infrastructure developments. Overall it is a good choice for the investment. Your service is nice &very useful.